Writing about video games, with a bent towards Design & Color lessons. 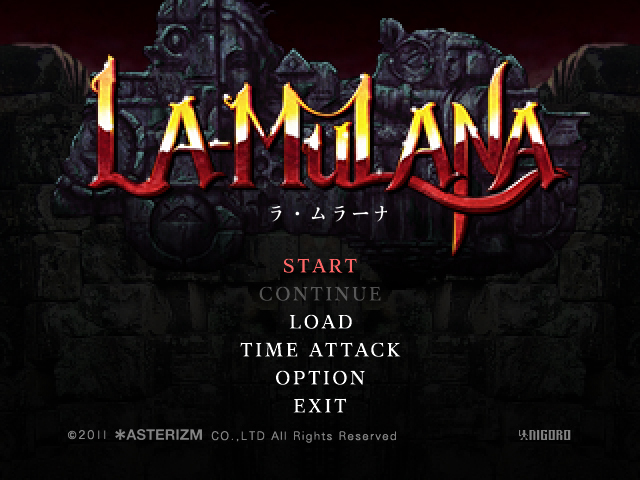 Thanks to my friend Dominic Tarason, and to Playism, I was able to get the beta for La-Mulana PC, and I (along with DeceasedCrab) have been playing through it. We've been keeping our impressions under wraps, but for those of you who are interested in the game, here's a handy guide to some of the most obvious changes! Full disclosure: I'm someone who has already played the original game almost to completion (I beat Hell Temple, but not the main game), and DC has beaten it upwards of three times already. As of the time I'm writing this, I'm about a third of the way through the game. First of all, the game's very visually impressive! The animation is very fluid and smooth, and there are a lot of really small details that look great--my favorite is when Lemeza is turning back and forth in the water, because he'll kind of paddle backwards/upwards awkwardly and it perfectly captures the feeling of flailing about in the water. There are a lot of little details like that that give a lot more personality to the game, and to Lemeza in general. This is the sort of thing the game thrives on! 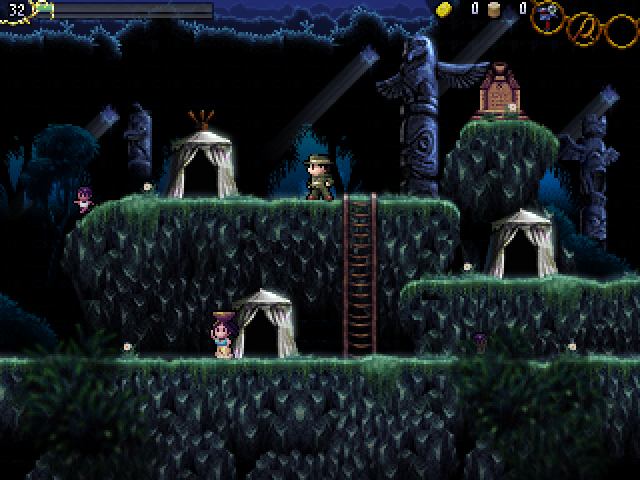 The backgrounds are beautiful, the sprites are well done (and pop out very well from the background, which is important! ), and the color palettes are deep and rich. Some of the themes of the levels have been changed--for instance, the Temple of the Sun doesn't have a cyber-technological motif running through it anymore, which is a bit of a shame--but each area still has a lot of personality and its own charm. Sound is pretty good. I'm not as fond of the mixing on the new version of the soundtrack, because it makes some tracks muddy or noisy to listen to, but I'm really enamored with some of the new melodies they've pulled out. In particular, I think Inferno Cavern and Spring in the Sky have been improved, and I really like the new additions to the soundtrack, like Mulbruk's theme and Eden. It replaces the chiptune sound of the original game with more MIDI-like instrumentation, so this is one aspect of the game where your enjoyment will vary considerably. But the most important things I'd like to talk about are changes to the flow and mechanics of the game, which are what's going to be on the minds of returning players. There have been one or two big changes to the controls that not everyone will enjoy, but it's not hard to get used to them. In the original game, the controls were [weapons: Z], [subweapons: X], and [item: C], with the Up arrow for jump. 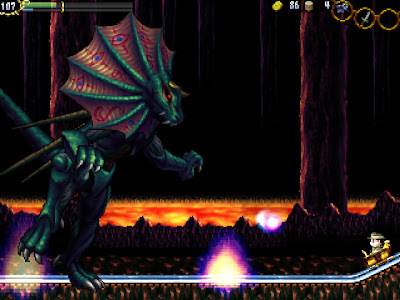 In the new version, it starts off as [Jump: Z], [weapons: X], [subweapons: C], and [item: V]. It really messed me up for the first few hours of the game, where I kept accidentally using my subweapons when I wanted to scan something. Thankfully, once you get used to it, it's fine, but it's something you should know about going in. You can also change the assignments of these buttons, but you can't assign Up to jump anymore. However, you still use the function keys to access the menus. They've been shuffled around a little, but it's nice to see that make a comeback--it complements the game nicely, since it was born as a tribute to a computer system in the first place. Big overall change: the game is much more accessible now. It's better at communicating its dangers to the player (example: evil-looking eyes will appear in the backgrounds of rooms where there are holy objects that will harm you if you whip them), and also better at communicating what things have changed and where. If you solve a puzzle and then travel to the room where it's affected, you will actually be able to watch the effect happen in front of you. It sounds like a no-brainer, but in the original it was easy to stumble around and solve puzzles without knowing what they had actually done. As a result, the game is faster-paced, though almost exactly the same difficulty as before. It's not that it's "easier" so much as it just makes more sense to play through, which I think is the important part. I would definitely recommend that someone who hasn't played La-Mulana before play this version, and then if they want another experience, play the original afterwards. In terms of game flow, there's a lot that's been changed or is otherwise new. A couple new subweapons (such as the caltrops, which remain on the ground for enemies to walk over), new items and item-use changes, and there have been entirely new puzzles put into the game, especially regarding access to the Confusion Gate. It's enough to keep returning players guessing. There's a very detailed Time Attack mode where you tear through sub-bosses and bosses in order as fast as you can, with various difficulty settings. Elder Xelpud will send you emails with information and general updates about the game, which pretty much replace all his useful dialogue in the old version. These emails are hilarious and adorable and probably my favorite part of the game. When you visit him in his tent, he still talks about all of his gaming habits, too. 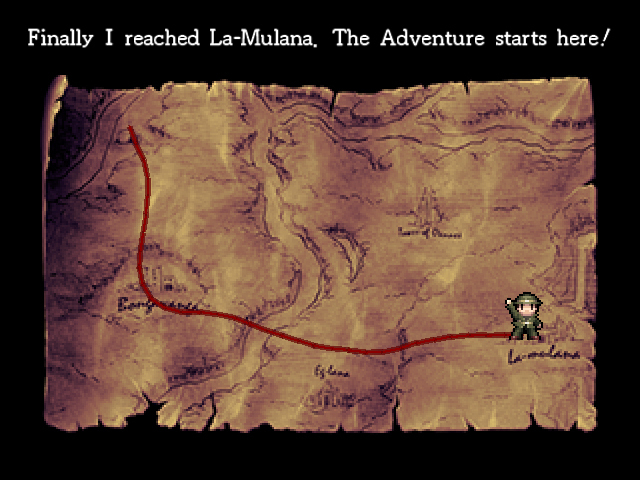 I'm really happy to see Xelpud so chatty, as his text is a huge part of the characterization of La-Mulana. There are a couple new or expanded female characters, which is really great to see, since the original game was so focused around the Lemeza-Xelpud-Shorn trio. One of them is Mulbruk, who is like Elder Xelpud but gives you more out-and-out hints and backstory (and provides you with an item at one point). The second that I've seen is the Fairy Queen, who gives you information on how to access the Fairies and also helps you out. In general, some of the backstory and mythology of the game has been changed, particularly regarding the different races of Mother's children and a recurring cycle of destruction throughout history. Really interesting stuff, I'm looking forward to unraveling the whole thing as I go along. Aside from just scanning skeletons and tablets, you can now scan statues, and the game will tell you what civilizations they were inspired by! For history and archaeology buffs, this is incredible, and it's great to see NIGORO sourcing their inspirations. The translation is excellent, by the way. I was on pins and needles about the translation this game would get, since there's a huge amount of text in the game, most of it cryptic. Thankfully, it's extremely good at getting its point across--Xelpud and Mulbruk both sound just fine and have well-developed voices. The hints on the tablets are often more confusing than not until you figure out their context and what puzzles they're referring to, but that's just La-Mulana being La-Mulana. I don't believe I've run across any areas where I know the puzzle and thought "this is not an effective way of communicating the solution." SO, ON THE WHOLE: this remake does everything right. It's perfect for new players, gives returning players a lot more meat to sink their teeth into, and fleshes out the world of the game without destroying the mystery that made it so appealing in the first place. It goes on sale July 13th at Playism-Games.com. It's good. You should buy it. Only one thing wrong... NOW MY HYPE IT'S IN BERSERK MODE!!! Personally I'm gonna be LPing this with a lag behind my normal play of it (I'm dedicating a whole day or two to playing it before I record anything so I'm a week or so in advance storyline-wise. I've played 2005 Mulana several times). That way, I can either figure out all the new puzzles OR find a walkthrough of it. I downloaded La-Mulana yesterday after reading your article. So far, it's even better than expected!